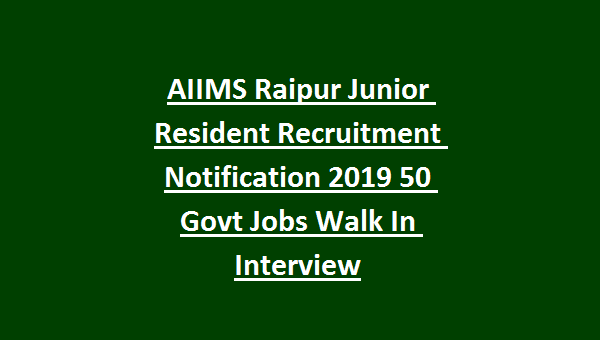 AIIMS Raipur Senior/Junior Resident Recruitment 2019: AIIMS, Raipur has been invited applications from the qualified Indian Nationals to recruit the Non Academic posts of Senior Resident and Junior Resident through walk in interview under PMSSY for 11 month contractual basis. There are total 00 Junior resident and 141 Senior Resident vacancies Jobs available in this recruitment of AIIMS Raipur. The candidates who are having the eligibility criteria they are suggested to attend walk in interview on given dates along with all required documents. For more details regarding this AIIMS Raipur Senior/Junior Resident Jobs Recruitment please see the details given below. Schedule of Walk in Interview at Medical College AIIMS Raipur, Committee Room, 1st Floor, Medical College Building, Gate No. 5, AIIMS, Tatibandh, G.E. Road, Raipur (C.G.) – 492099. 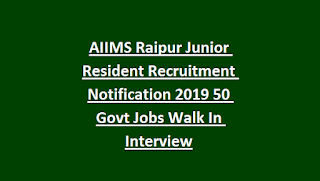 There are total 0 Junior Resident Jobs and 141 Senior Resident Jobs in this AIIMS Raipur Recruitment 2018. As on 10-01-2019 upper age limit is 30 years. For SC/ST 35 years, OBC 33 years. Application fee is Rs.1000/- for General/OBC candidates and No fee for SC/ST/PWD/Women candidates. Fee to be paid through DD only in favor of "AIIMS Raipur" payable at "Raipur". Should have registered with the Chhattisgarh State Medical/Dental Council and Medical/Dental Council of India. For Senior Resident The candidate must have done post graduation after MBBS/BDS in MD/MS/DNB/DM/SCH/MDS from the respective subject with internship. M.Sc (Non Medical candidates) in related subject from an recognized university. Candidates with MD/MS/Ph.D. from recognized University/Institute in concerned subject is prefered. Selection will be held based on marks secured in educational qualifications, experience, and personal interview. The candidates have to submit the the application form through online only using the official website of AIIMS @ http://www.aiimsraipur.edu.in/. At the time of interview, the candidates have to bring applications copy and fee paid copy along with all necessary educational certificates,, community certificates and all other required documents. Download the official notification & Application form for Bhopal AIIMS Junior Resident Jobs Recruitment. Please share this AIIMS Aiims Junior Resident Recruitment 2018 with your friend via facebook or Google Plus. There are total 156 Senior Resident Jobs available in AIIMS Bhopal.